Americans today are generally aware that we consume far more energy per capita than most of the world's peoples, over four times the world average and double that of regions like Japan and Europe which enjoy a similar standard of living. Most of us reflect on home gas and electric bills plus the fuel pumped into our cars' gas tanks when judging our personal energy footprints. 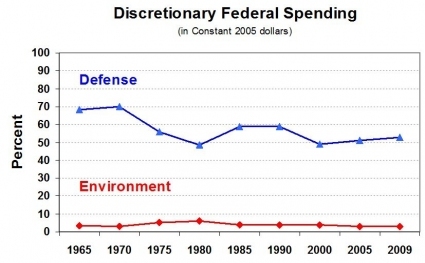 But in reality it is all the "stuff" Americans accumulate that contributes most heavily to our total energy consumption. To understand why this is true, it is necessary to first get a handle on the ways societies utilize energy. By convention, the energy-consuming activities of society are divided into the four sectors described below: residential, commercial, industry and transportation. The pie chart below shows the percentage of total US energy delivered in a year to each sector, according to recent US Energy Information Administration figures. 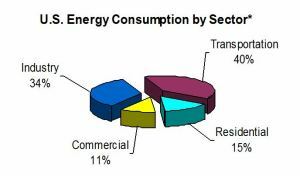 Note that the very same pie chart describes the average per capita energy consumption of Americans in the four sectors. The residential sector reflects the energy used to run our homes (to power lighting, appliances and heating & cooling systems) and, at fifteen percent, it is the next to smallest pie piece. At forty percent, the transportation sector is largest but includes all energy inputted to move both people and goods about, be it by car, truck, train, plane, boat or pipeline. Given that about half this amount goes into shuttling people, this means that personal transportation and running our homes together account for only about 35 percent of the energy we Americans use. An additional eleven percent goes to meeting the energy demands of commercial/institutional buildings which constitute the entire service sector of society - businesses, organizations and institutions including schools, hospitals, correctional facilities, stores, restaurants, theaters, et cetera - all of which expend energy for lighting, temperature control systems and appliances like computers and faxes. Though relatively modest, the energy that supports these shared facets of society is overlooked by most of us when contemplating our energy footprint. And also generally overlooked is our personal contribution to the industry sector which, at 34 percent, is on par with the energy sunk into running both our homes and vehicles. This sector covers the production of all the "stuff" that makes up the typical American lifestyle, everything from hamburgers, clothing and golf clubs to dishwashers, pharmaceuticals and satellites, plus all the factory machines that make stuff ... virtually every manufactured or processed object you can name. The energy used at every step in production is figured in, starting with extraction of raw materials to final assembly. A run-down of the energy-sapping steps involved in the production of a hypothetical polyester/cotton blend T-shirt, abstracted from the book Stuff: The Secret Lives of Everyday Things (1998) by John C Ryan and Alan Thein Durning, drives home the point. The shirt's polyester component derived from a few tablespoons of crude oil pumped up from a mile-deep well in Venezuela and shipped to a refinery on the island of Curaçao before being piped into a twelve-story steel cracking tower where the many different hydrocarbons which make up the crude are separated out. Additional oil was burned to heat the crude to the 750 degress Fahrenheit needed to yield petrochemicals like ethylene and xylene from which polyester is synthesized. Growing the shirt's Mississippi cotton is also energy intensive from the start because of the heavy irrigation (electrically-driven) and frequent dousing with synthetic pesticides that is standard practice in the cotton industry. In addition, a crop duster burning diesel fuel from Mexico applies a defoliant before harvesting. To pick the cotton, a worker sits in the air-conditioned cab of a diesel-powered cotton stripper manufactured in the United States from parts imported from twenty countries. Once a cotton gin separates the fibers from the seeds, the fibers are trucked to a textile mill in North Carolina to be spun into yarn. Another mill knits the cotton and polyester into fabric. The point here is not that anyone who cares about energy conservation should never buy a T-shirt, but rather the T-shirt saga illuminates how an individual's purchasing habits contribute so heavily to his/her personal energy footprint. Given all the hidden energy embedded in manufactured and processed goods, Americans will ultimately need to do more than add solar panels to our rooftops and drive fuel efficient vehicles to transition away from a fossil fuel-based economy and to mitigate global climate change. We will need to accept that a culture and economy based on endless consumption of stuff is simply not compatible with a rational solution to our nation's energy dilemma. But it won't be politicians asking us to consume less of what we don't really need that will lead to a more sustainable energy culture. Nor should we expect that industry will any time soon label products with the amount of energy used to produce them, though it would empower consumers to make smarter energy choices.